It's unconfirmed at this stage, but there is every chance that we have our first hatching. 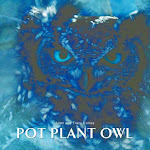 At 11h50 local South African time, viewers saw Pot Plant Owl eating an eggshell. Hours before, we had noticed PPO's change of behaviour to mirror what we usually see at this time when the chicks are due. PPO fidgets a lot in the nest, looks down and bends her head out of view. She sits more upright and we can confirm from our bedroom door view of her, that PPO is 'perching' rather than laying flat down. And the final tell-tale sign that could very well make the arrival of a chick true, is PPO's constant hooting today, and Pappa's immediate reply. I'm not one for counting my chickens (owls) before they hatch, so I will try not to get too excited until I see the tiny bundle of white fluff for myself - or at the very lest, see it on someone's video or photograph. So I encourage you all to keep a close eye on her, and see if you can spot our first PPO chick of the season. Happy viewing! Yeah! Happy days! Thanks for the update Tracy and Allan. Tracy, I hope you are feeling better today! So eggciting!!! I saw Bob's pic of the eggshell on PPO's Facebook page. Woooo hoooo! Beautiful PPO and Pappa, cannot wait to see your little fluffy babies!